Windies are all set to take on Bangladesh on Wednesday, July 25, 2018. Bangladesh clearly showed their intention in the first ODI and gave the message that they cannot be treated as underdogs anymore. In Today’s Dream11 Fantasy Cricket Match of WI vs BAN 2nd ODI, we will cover Fantasy Cricket News, Pitch Report of Providence Stadium, Guyana, Toss Prediction, Probable Playing 11 and Who Will Win? Who Will Win the 2nd ODI Match, Between WI vs BAN and Toss Prediction? Where Can You Watch the Live Streaming of WI vs BAN, 2nd ODI or Channels to Watch? Bangladesh gave a message that they cannot be treated as underdogs anymore. All the departments of BAN have performed. On the other hand, WI failed to deliver in the last ODI. Both the teams have an equal chance of winning. According to our astrology prediction, WI will win. The team winning the toss should opt to bat first as chasing will be a difficult task on this ground. According to our astrology prediction, WI will win the toss and they will ask BAN to bowl first. Date: The match will be played on the 25th of July 2018 (Wednesday). 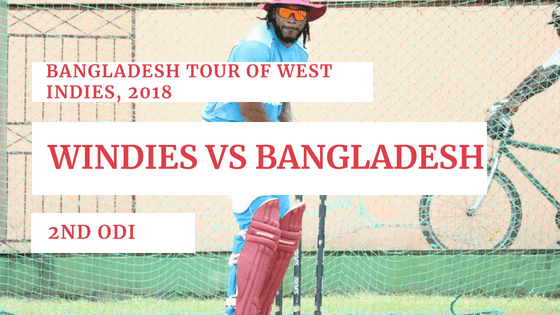 Match: Bangladesh tour of West Indies, 2018, WI vs Ban, 2nd ODI. Time: 06:30 PM GMT, 12:00 AM IST, 02:30 PM Local. The pitch will be almost the same as it was in the first ODI. It will be on the slower side and the spinners will get the maximum benefit. The batsmen can only score good runs if they spend some time playing carefully. Overall the pitch will be spinners friendly and it will have turn and bounce. Note: If you know how the pitch will play, then you can select your team according to the pitch. Make use of the pitch while selecting your team for fantasy leagues. From the above pitch report, you would have understood that making a team which is a combination of batsmen and spinners would be a wise choice. In the morning, a scattered thunderstorm is predicted. It is expected to be partly cloudy during the time of the play. The game may be interrupted due to rain. The temperature is expected to be 29-Degree Celsius and the humidity to be 75%. If we look at the last five matches, BAN has won two matches out of five matches whereas WI has won three games out five games. In overall encounters, West Indies have won 19 matches and Bangladesh have won 8 matches. In the last encounter, BAN defeated WI by 48 runs. The average first inning score of this ground is 231. The average second inning score of this ground is 195. Highest total on this ground is 309/6 in 49 overs by WI vs PAK. Lowest total on this ground is 98/10 in 41 overs by WI vs PAK. Note: If you have the details of scoring pattern then you can get a fair idea of the scores, the team can make. It is predicted that today’s match will be high scoring game. Sony Six HD and Sony Six has all the exclusive rights to broadcast the live coverage of Windies vs Bangladesh 3 Match ODI (One Day International) and 3 Match T20I and Two Match Test series in India and its Subcontinent countries like Afghanistan, Bhutan, Sri Lanka, Bangladesh, Maldives, Nepal, and Pakistan. All the matches will be streamed live in India and its Subcontinent Countries on Sonyliv Digital Platform (App and Website). Shimron Hetmyer, Chris Gayle and Devendra Bishoo are the key performers of West Indies Team. WI may make a couple of changes. Keemo Paul and Kieran Powell may get a game. They will only make these changes if they need a batsman. Chris Gayle, Shai Hope (wk), Shimron Hetmyer, Rovman Powell, Devendra Bishoo, Alzarri Joseph, Evin Lewis, Jason Mohammed, Jason Holder (capt), Andre Russell, Ashley Nurse. Shai Hope (wk), Ashley Nurse, Jason Holder (c), Keemo Paul, Chris Gayle, Jason Mohammed, Andre Russell, Evin Lewis, Devendra Bishoo, Kieran Powell, Shimron Hetmyer, Rovman Powell, Alzarri Joseph. Tamim Iqbal, Shakib Al Hasan and Mashrafe Mortaza are the key performers of Bangladesh Team. Liton Das may get a chance in place of Anamul Haque. This is the only change BAN can make but this is very unlikely to happen. Tamim Iqbal, Shakib Al Hasan, Mahmudullah, Mosaddek Hossain, Mashrafe Mortaza (captain), Mustafizur Rahman, Anamul Haque/Liton Das, Mushfiqur Rahim (wk), Sabbir Rahman, Mehidy Hasan Miraz, Rubel Hossain. Mashrafe Mortaza (c), Nazmul Hossain Shanto, Mushfiqur Rahim (wk), Mustafizur Rahman, Tamim Iqbal, Abu Jayed, Anamul Haque, Abu Hider Rony, Shakib Al Hasan, Mehidy Hasan, Sabbir Rahman, Rubel Hossain, Mahmudullah, Nazmul Islam, Mosaddek Hossain, Liton Das. Fantasy Cricket Expert Tips: Both the players are good. You can select any one. 61.13% of the users have selected Mushfiqur Rahim in their Dream11 Teams and 36.9% f the users have selected Shai Hope in their Dream Teams. Conclusion: This is it for Today’s Dream11 Fantasy Cricket Match Prediction of WI vs BAN, 2nd ODI Match, which will be played on Wednesday 25th July. We have covered all the details required to win any fantasy leagues.